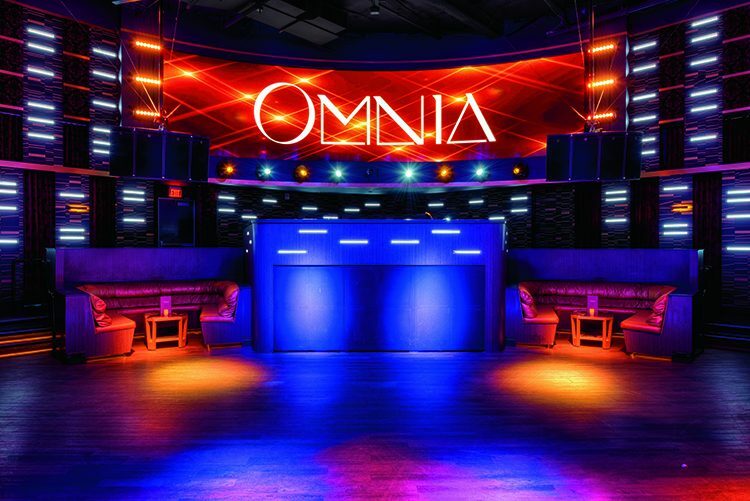 Having established the Omnia brand in the party capital of the world, Las Vegas, Hakkasan Group decided to refurbish an existing venue in its portfolio to expand the Omnia experience to San Diego. The newly redeveloped 19,000 sq ft venue features three distinct spaces for guests – the main club, balcony level and rooftop terrace with scenic views of the city – all of which have been kitted out by Audiotek, the design and installation company behind the original Las Vegas concept. 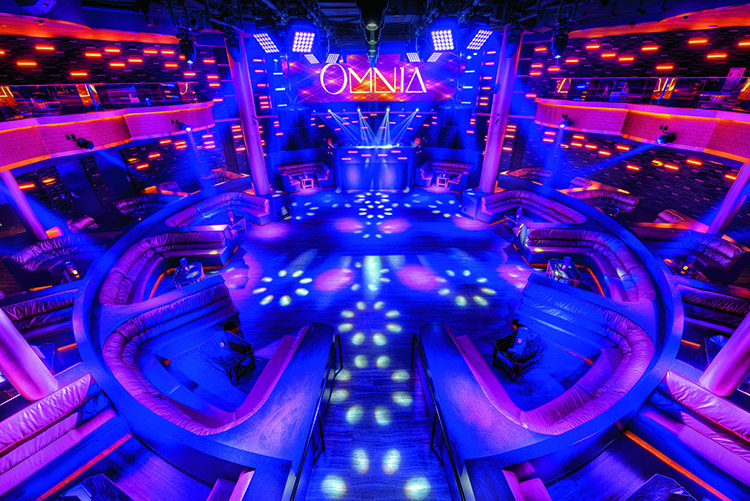 Technical Manager, Chris Kmiec explained further: “The brief was to create the Omnia Las Vegas feel in a much smaller room, using a lot of the same design influences. 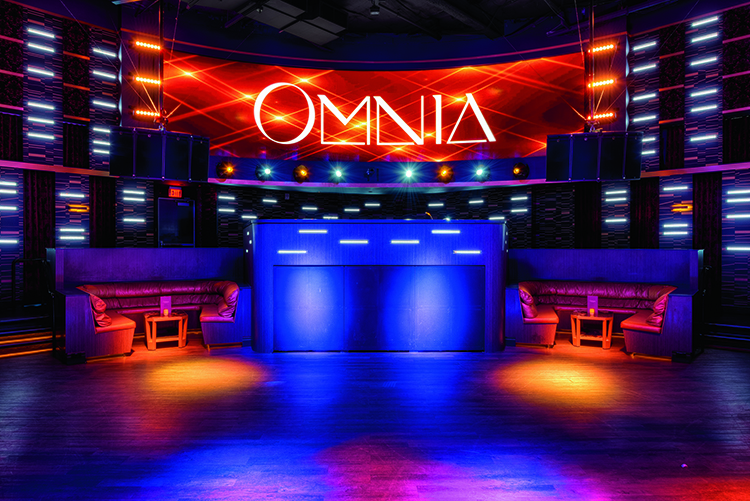 There was no room, or budget for giant 10,000lb kinetic chandeliers here as there was in Omnia Las Vegas, but through clever deployment of intelligent lighting fixtures and a large video wall, we were able to create the same vibe in the room. 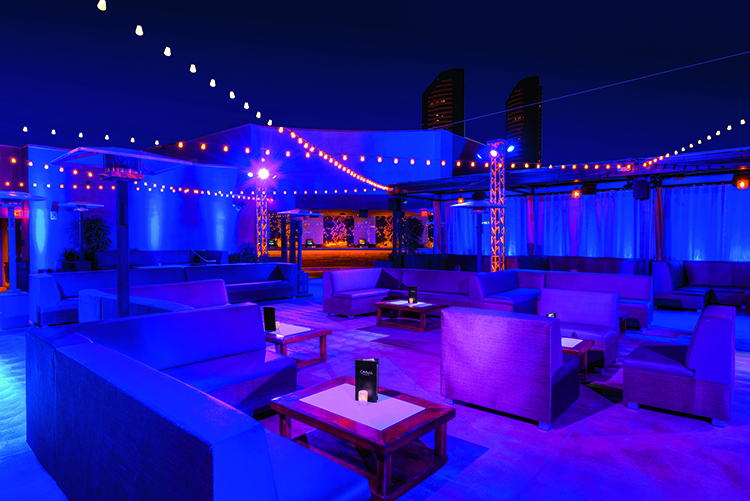 In San Diego’s main club room, Chris and his team deployed a stereo system that sits either side of the DJ booth with support from balcony and under balcony delay fills. Four L-Acoustics ARCS II cabinets are flown left and right of the DJ with six L-Acoustics SB28 subwoofers installed underneath the booth to pump out low-end onto the dancefloor. A combination of six L-Acoustics 8XTi and six L-Acoustics 12XTi fills are fixed in the balcony areas as delays. Four L-Acoustics KARAi with a single L-Acoustics SB18i subwoofer are also in place for DJ monitoring. The PA is powered by six L-Acoustics LA8 amplified controllers. For the rooftop terrace, the audio requirement was somewhat different. To go with the more lounge and seated feel of this space, and the introduction of cabanas around the rooftop, Audiotek deployed a distributed sound system consisting of 30 Tannoy Di8 loudspeakers, powered by Lab.gruppen IPD 1200 amplifiers with built-in DSP and control is provided by a QSC Q-SYS system based around a Core 250i, which not only handles the rooftop but the main room as well. Sitting alongside this ample audio system is an equally impressive lighting and visual element. For this Audiotek specified a 30ft by 8ft Absen A103 LED wall installed behind the DJ booth. 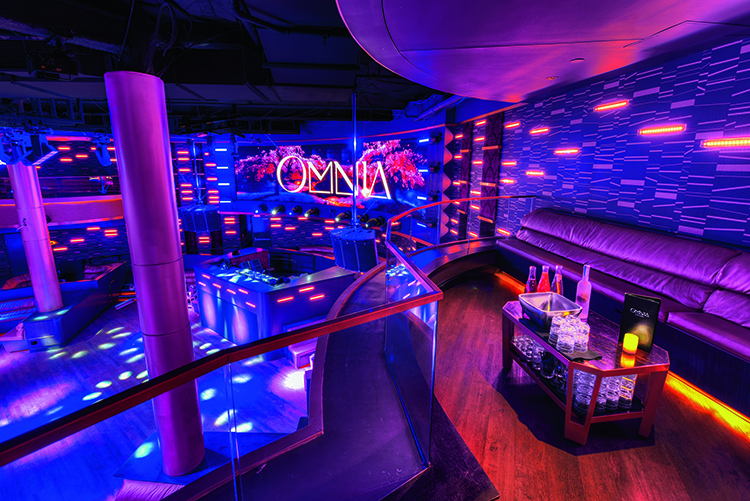 Although to bring the Omnia brand vibe to the venue, the video content needed to extend beyond the screen and be present all around the room. In order to achieve this 200 Martin by Harman VC Strips were installed in the walls and across the front of the DJ booth. The lighting was built around the LED wall. In the ceiling, Audiotek mounted 16 Robe Pointes and four Ayrton MagicPanel-Rs and the LED wall is flanked by a further eight Ayrton MagicBlade-Rs and 12 Robe Robin 100 LEDBeams. Replicating an existing venue – albeit it on a smaller scale – may appear a simple task at first glance, but to do it to a high standard adds another dimension. Omnia’s reputation on a global level means nothing but the best would do.